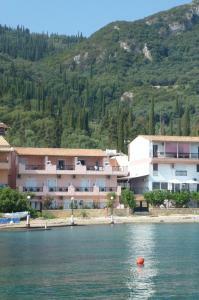 Aeolos Studios Kefalonia price per day from € 27 . Drosia Rooms price per day from € 30 Set on an elevated position, 700 metres away from Spasmata Beach, Drosia Rooms offers air-conditioned accommodation with views over the Ionian Sea. Rooms at Drosia are simply furnished with tiled floors and open out to private balconies. Town of Lixoúrion (~5.5 km). 50+ apartments ! Town of Valsamáta (~10.3 km). 4+ villas/holiday houses ! Town of Mousáta (~12.6 km). 110+ apartments ! Town of Sámi (~17.3 km). 84+ accommodation units ! Town of Pástra (~24.8 km). 2+ apartments !